Oxygen cleaned welding gauges (cleaned for oxy. per A.N.S.I. B40.1) suitable for use with oxygen, other fuel gases and medical equipment that are non-corrosive to brass or bronze and where stem mounting is desired. Quality brass construction with one piece polycarbonate posi-lock lens. Recommended for use with compressed gas regulators. Gauges over 1000 PSI UL Listed. 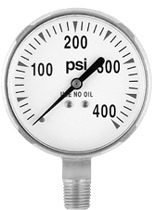 DIAL SIZE: 2" and 2 ½"
Standard dials available: PSI only, PSI/Kg, PSI/kPa or PSI/Bar. Other scales and special configurations can be custom built to your specifications. For more information, contact us at 800/323-5111. Other Flowgauges can be built to your specifications.